I figured if I am going to do a review of genetically engineered crops, I needed to address the other major traits besides resistance to herbicides presently on the market. This one addresses a family of proteins found in the bacteria Bacillus thuringiensis that can kill insects. Anyone who reads about the public policy debates swirreling around genetically engineered crops will be familar with the two letter abbreviation ‘bt’ as in bt corn, bt cotton, bt ginseng (the last is fictional). What always surprises me is that some people STOP reading before they come across an explanation of what bt stands for. Just typing bt into google won’t bring up a relevant result until the 30th hit (two letters just isn’t very unique). I have talked with people who are convinced bt stands for everything from biologically treated to BioToxin. It doesn’t. The name actually comes from a species of bacteria called Bacillus thuringiensis. Different substrains of the species carry different members of a family of genes that code for Cry proteins (and separately can also carry genes that code for Cyt proteins*), which can kill insects. Finding chemical or biological means to kill insects isn’t that hard. What makes the Cry proteins noteworthy is how selective they are in their killing. 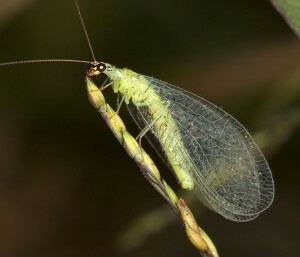 A given Cry protein is dangerous to only a small subset of insect species. And that’s important, because, for every** western corn rootworm, european corn borer, or earworm there are also benign or even beneficial insects in and around fields like lacewings, trichogramma wasps, or those rootworm eating nematodes I talked about a couple of days ago, which aren’t insects, but also harmed by insecticides. (Agro-ecology is beyond my field of expertise, had to call up my tipster from the previous post to get this list) When a crop is genetically engineered to produce one of the dozens of Cry proteins discovered in Bacillus thuringiensis, it replaces or reduces the spraying of insecticides to control insect pests, with positive effects on insect biodiversity. The reason Cry proteins are so dangerous to such a specific group of species has to do with their mode of action (the way they kill insects). After an insect eats either the protein itself (for example from the roots or leaves of a plant genetically engineered to express one of the Cry proteins) or Bacillus thuring. bacteria (which can make the proteins in an insect’s stomach), Cry proteins spread through the digestive system until they bind to specific proteins sticking out of cells in the walls of the insect’s gut. Once bound, the Cry proteins form holes called pores in the surface of those cells. Opening holes in cells is a good way to kill them, and Cry does just that. The insect dies from the inside out as its digestive system is destroyed or starves to death with a belly full of food once its digestive system is too damaged to extract energy and nutrients from its food. 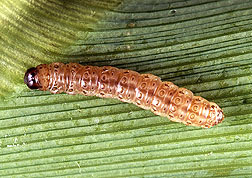 In the wild, Bacillus can now reproduce and thrive inside the rotting body of the insect. On a farm, insect pests that nibble on crops die too quickly to do significant damage, let alone breed and lay countless eggs that would have each developed into a new hungry insect. Most importantly, the different Cry proteins’ ability to bind to proteins on the stomach wall of insects. Each Cry protein can only attack the surface of cells once it has bound to its specific protein target. Many insects won’t even produce a protein that specific Cry can recognize, and the protein passes harmlessly through their digestive systems. Cry is only dangerous when eaten, unlike most insectidial sprays which can kill from contact. Even if an insect closely enough related to the target pest to be vulnerable to the same Cry protein is in a field of bt crops, as long as they don’t actually EAT the crops (which if they’re not a pest, they don’t do anyway) they’re completely safe***. People worried about eating bt crops themselves should see point #3. Proteins are like tools, in that their functionality depends on their shape. **** A screwdriver that’s been melted back into a muddle of metal isn’t much use as a screwdriver (or anything else) anymore. Similarly a protein that loses its shape (called denaturing) loses all function. In their natural environments, proteins are very good about holding onto their shape, but when the environment changes, their shape can fall apart. Lots of things can make a protein lose its shape, including heat and pH. One of the reasons we cook our food is that denaturing proteins also makes them easier to digest. More importantly in this particular case is the issue of pH. We humans have acidic stomachs which helps to break down our food. Insects have basic stomachs for the same reason. Both acids and bases are good at breaking things down (think sulfuric acid and drain cleaner respectively), but the two are chemical opposites of each other. Cry proteins have evolved to function in the high pH environments of insect guts, and denature in our own low pH stomachs, and without shape, Cry proteins might as well be any other random string of amino acids. The two crops where Cry proteins are having the most significant effects are corn and cotton. Eggplant may be the next bt crop to be approved, but it’s still working its way through regulatory approval in India. If you want to learn more, I highly recommend this site, maintained by a lab at UCSD. *Cyt proteins are another unrelated group of insecticidal proteins found in some of the same bacteria. **This is a figure of speech, I’m not actually saying beneficial and insects and pests are always present in equal levels. ***This is a slight over simplification. For discussion of the exception (a study back in 1999 found that caterpillars feeding on leaves coated with excessive amount of pollen from one specific kind of bt corn could sometimes recieve a lethal doese). Here is a more thorough discussion. More importantly here’s a paper that spent two years trying to find effects on butterfly populations without success. ****Proteins are long strings of amino acids, that fold into specific shapes based on the order of amino acids and how attracted or repelled each amino acid is to every other one. It’s very complicated and even our best computer models struggle to predict the shape of a protein based on its sequence (there are too many interactions to easily simulate). *****Karl has a good post up on Biofortified pointing out that people too often see genetic engineering as solely the province of a single company, when in fact there are a number of competing seed companies in the field as well as genetically engineered crops that are produced by publicly funded and non-profit organizations.